This study titled Who Borrows Private Loans has various data on the demographics of private student loan borrowers. Its from 2007 but new enough. I pulled some data from the study to make the charts below. 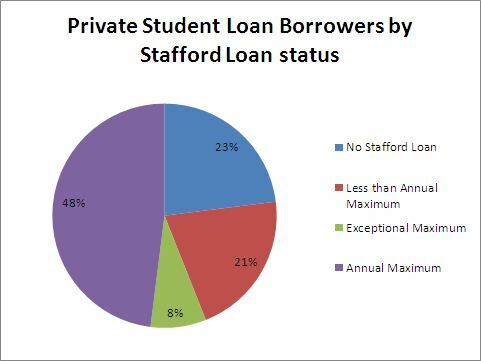 First we look at whether or not private student loan borrowers have Stafford loans or not and if so if they maxed out their Stafford loans. Almost a quarter of private student loan borrowers have NO Stafford loan. Another 21% of private loan borrowers have Stafford loans but they didn't take out the max available. Altogether there are 46% of students borrowing from private student loans who haven't borrowed as much as possible from Stafford loans. All of these students should be maximizing the Stafford loans before getting a private student loan. Not all students qualify for subsidized Stafford loans but even if you don't have financial need you can still get unsubsidized Stafford loans which are better terms than private loans. Second here's a look at what type of university or college the private student loan borrowers attend. As I would expect a large number of the students attend the generally more expensive private non-profit four year universities and the for profit universities. 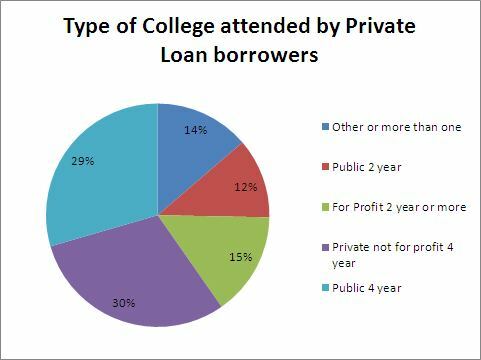 However as you can see theres still a significant number of students going to both two and four year public schools who borrow private lenders. 12% of private loan borrowers are attending public two year universities. Its hard to see why someone going to a public 2 year university would really need private loans. Community Colleges are generally rather cheap to attend and if you can't afford the cost of school then you would at least have money available from Stafford loans. If Stafford loans or other financial aid aren't enough then you should be getting a part time job. "Almost 90 percent of private loan borrowers apply for other types of aid, and 64 percent receive some type of grant assistance." "When students who do not meet the eligibility criteria for federal student loans are excluded, one out of five undergraduate private loan borrowers did not first take advantage of federal student loans. Half of these students did not file the necessary application for federal student loans." 10% of private student loan borrowers did NOT apply for other types of aid. It seems to me that those 10% of students are likely missing out on some aid. I would guess that some if not most of that 10% didn't apply for aid because they assumed they would not be eligible. But as I pointed out before you can still get unsubsidized Stafford loans even if you don't have financial need.